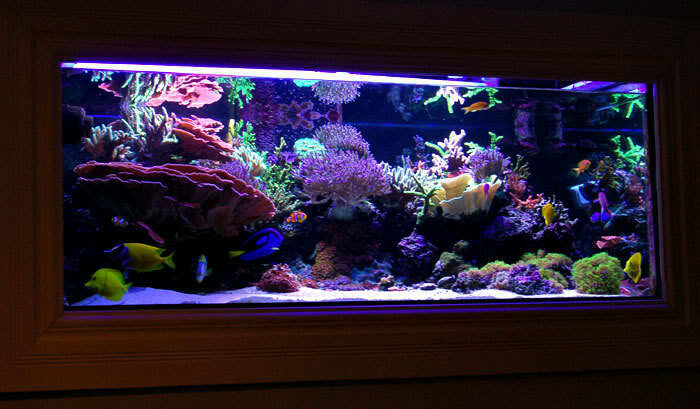 When we dream of the perfect tank we often think of having an in-wall setup for the simple fact that it looks awesome. You don’t have ANY fish stuff in the room, not even a stand. In-wall setups keep the environment much more controllable and reduces unwanted tampering. This is a very nice setup for someone who does not plan on trying to sell their house for what it was worth before the In-Wall installation. Besides, the humidity often can cause localized water damage to certain materials and that can be a cause for long term damage. Most of us are somewhat mobile with the fluctuating economy. For those of you who know you will need to sell your house but still want that in-wall look there is a very easy alternative that could even be relocated or sold. First you need a tank. 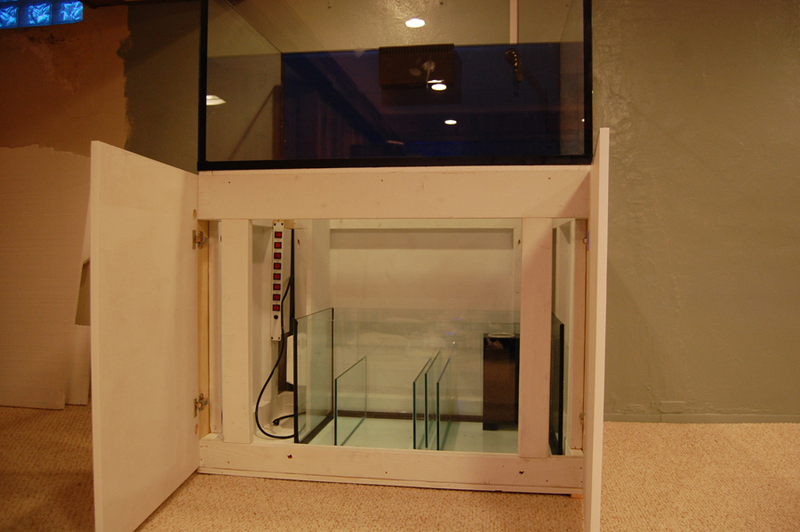 You can use any stand that can hold whatever tank you choose, but if it is possible to build one you will have a better time with customizing your access points and you won’t be as limited on sump size. I would have a sump as large as my swimming pool if I had the room for it. Go as large as you can whenever you can. Placement for your tank will be the next step. Where do you want it? Is it going to be against a wall or do you want to have an Island or Peninsula style tank? You can easily turn a simple aquarium into a false wall/room divider in a weekend. Figure out a spot to situate the tank and get out the note pad. If you want a tank that is only viewable from one side this makes the job a little easier. The idea here is to create the illusion that there is a room behind your tank while actually housing your equipment within the false wall, which is why a DIY stand is the best route. You will want the stand and the wall to be separate entities or it will be difficult to install and uninstall your setup. The stand will be moveable and the wall will be removable. There will be a wall infront of the tank with a view hole (frame) and the top and bottom will be trimmed and to match your existing wall. You can tape and mud the seams where the false wall meets the real wall since that is easy to cut and patch upon removal. The specific design will be based off your existing walls and trim unless you plant to redo the whole room to match the new tank. As far as the look of the peninsula, you will have more room to make it look differently than your wall and trim. Treat the design as though you are adding a new piece of furniture. You can also mimic the wall and trim of your room and create a false pillar type of look. The transition between the ceiling/floor and the false pillar must look as permanent as possible without actually being stuck there forever. Trim is, of course, the easiest to go about it but if you do not want a trimmed top you can go the same route as with the wall tanks. Tape and mud the pillar to the ceiling. Connecting a remote sump, or one that is located farther away, only requires 2 holes or one large one. If you have a basement located beneath the tank you can easily drill the floor. Wood flooring may be present, so this may not be a great option for your situation. Walls are much easier to repair. False wall setups with fish rooms behind them are fairly easy to construct. A fish room can easily designed to accommodate a bathroom. If you have a large enough area for a fish room you can install a floor drain where a toilet would go and a utility sink where a shower and/or sink could go. You could even remodel the room into the bathroom first and incorporate the fish room around the toilet. Now that would be a dedicated movement. Don’t spray Air Freshener or you’ll experience Cyanobacteria. It would at least make a great place to dump your skimmer and old saltwater. 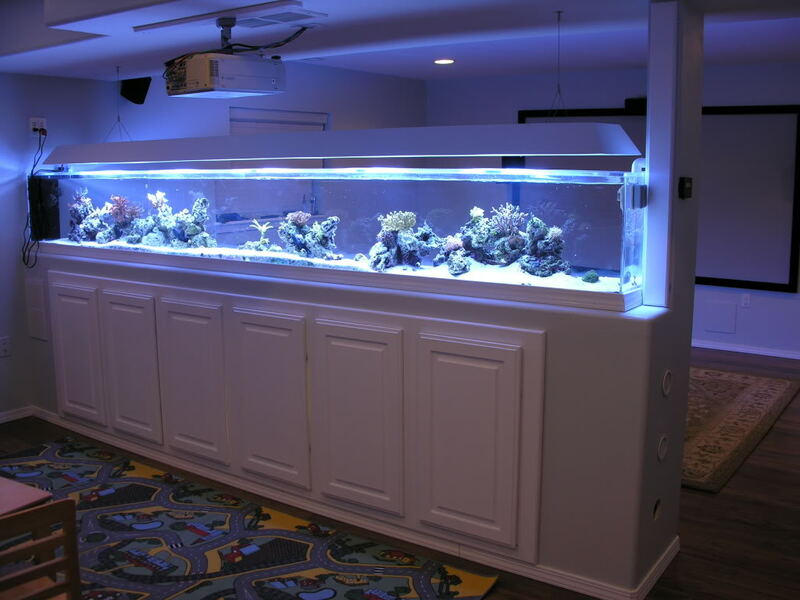 With some ingenuity you can take an ordinary tank and make it a semi-permanent part of your room without degrading the value of your home. Don’t be jealous of other in-wall tanks ever again! Grab your saw and hammer and head on over to the (DIY Forum) to start designing yours today!